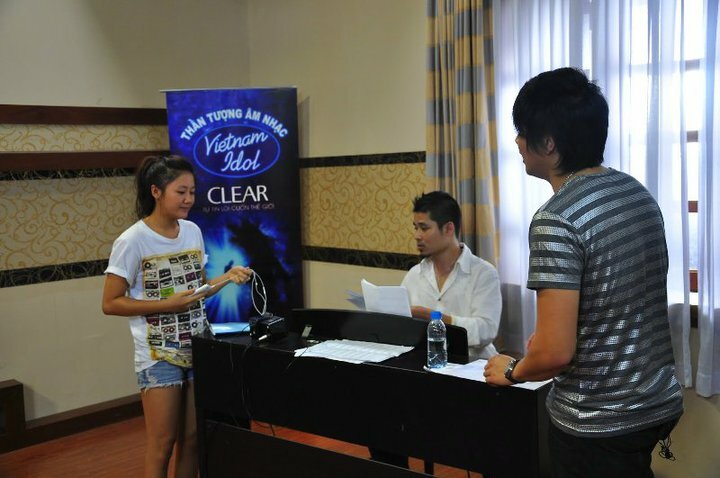 As the wait for the Vietnamese version of his album’s first single continues, below are some photos from Bui’s mentoring sessions with VN Idol’s Top 7 finalists. He was summoned to help contestants with their pronunciation for the International Hits round (which all ended up being English, how convenient) and to also share his experiences from his Australian Idol days. For a little girl with such a big voice, she definitely won me over some past few performances. However, for a song of this caliber, I personally think Huong’s take on it lacked oomph. Instead of outdoing the song, the song seems to have outdone her. First and foremost, I would like to say that this dude can hold a note. He can sing and there’s no doubt that he has made it this far based on talent (let’s not point fingers…). But with that said, this was an absolute terrible performance. In no way did this song do his voice justice nor the instrumentals do the song justice. The pronunciation could also take the brunt of the blame, but I’m one to think that a song is best portrayed via emotions rather than syllabic accuracy, although given that it’s in English and he probably had no idea what he was singing, we can assume that that was the downfall. I admit, I am more intrigued by her unique voice and physical appearance rather than her actual vocal range, which is pretty limited if you ask me. This performance is nothing special, but it is an improvement from previous ones. For someone who has been treading safe grounds for so long (her performances lack the dynamics to to keep me invested), Leu would be better off as a Vpop singer than a “VN Idol winner”. The latter entails too much vocal expectations from her extent. I don’t care how his fandom see it, I would once again like to reiterate that this is NOT a “VN Idol” performance. Cute performance. Just not “VN Idol”- worthy. He might be able to decently hit all of the notes, but there’s like what, 5 notes in this rendition of the classic? I have yet to see him break free from his comfort zone and is now even more skeptical on his ability to do so. To sum up this performance: all foreplay and no climax. It puzzles me to acknowledge that he has made it this far based upon his “vulnerable, pretty looks”. I sincerely thought this was a nice performance (and song) but like the judges also pointed out, she did seem nervous. At certain points, her sustained notes sounded a bit off due to flawed microphone techniques–something singers should use to their advantage, not against! Regardless, I don’t think she deserved to go home yet when the likes of coughcough are still advancing. I was worried if she would be able to outgun her initial best performance, but was not the slightest bit disappointed. Alicia Key’s “Fallin” fit her to a tee. The only con I could possibly name was the intro which for a second misled me into thinking she’d follow up with “Naaaaaaaaaaaaaaaaaants ingonyama bagithi Baba!” I’m sure she could have pulled off an equally kickass version of “The Circle of Life”, though. Hong Nhung, My Tam, My Linh, Uyen Linh….the name already rolls well with its diva predecessors. Honestly, I feel like boy’s in the wrong competition. What he does onstage are oftentimes more interesting than the actual execution of the song itself. Instead of enhancing the performance, I find it extremely distracting and even ridiculous. I first came across his singing in the drama Buoc Nhay Xi-Tin/Teenage Dance Steps and thought it quite nice. However, when placed onto a national platform, his style is too teen-poppy for a competition so prestigious. I would gladly listen to his album if he were to release one, but don’t think I could ever bring myself to watching him perform them. As for the judges (hahaha, am I allowed to judge the judges? ), it’s a relief that Dang Diem Quynh joined the show seeing how constructive her comments are. When you have Quoc Trung–who only says if it’s good or bad, Quang Dung–who only says if it’s marketable or not, and Siu Black–who is too much of a sweetheart to outright criticize (the meanest thing she has probably said is her catch phrase, “You can do better!”) all on one panel, I can’t see how anyone is to really improve. Thus, it’s particularly interesting to hear Diem Quynh’s bit. In the past few rounds with her presence, I’ve also noticed this rubbing off on the other 3 judges. Maybe they were just planning to delve deeper with their comments nearing the finale days, but it’s satisfying to finally hear something more than just their usual chorus of random critiques. The judges are now more interactive, crack more jokes, and Dung Khung is actually speaking relevancy. His comments grow funnier and less shallow within each show, I can’t help but want to high-5 the man. To think the day would never come! On an overall note, I still can’t tell if VN Idol is setting out to find an entertainer with good vocals or a vocalist with an internationally big voice. I’m aware that it all comes down to text-votes, but when you think about it, texting in Vietnam hails modern audiences, that currently being mostly teens and/or girls (the risky formula to any fangirly involvement). Well, if it was up to these fangirls’ volition, Dang Khoa might just steal the title. May all hell break lose, then. Oy.
. First time watching viet idol is it’s not bad. Just that some of them are not experienced therefore didn’t choice songs that suited for their vocal and tone. they let the audience saw flaws in their vocals.